and natural chiropractic care and individualized wellness coaching. Why live a less-than-optimal life by chance when you can live well on purpose? 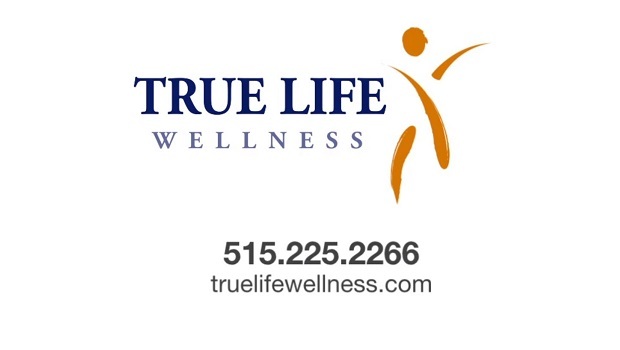 Waukee chiropractor, Dr. Tyler Molstre, wants to help you experience revitalized health at True Life Wellness. We offer natural healing solutions and individualized lifestyle wellness coaching for the entire family. Dr. Tyler Molstre utilizes hands-on chiropractic adjustments to be able to provide gentle, effective care. Our friendly team looks forward to helping you and your family live healthy, happy, longer lives! People seek chiropractic care for many reasons. Perhaps you are looking for pain relief, wellness care or are tired of masking symptoms of disease with medications. In today’s society, there is a pill for every ill. Many are raised to believe that when you feel well, then you are well, and when you do not feel well, there is a medication you should be taking. The human body is designed to be self-healing and self-regulating. Our bodies have the incredible ability to heal naturally from within when it’s free of nerve interferences associated with a subluxation. Chiropractic care, along with a well-rounded wellness lifestyle, will put you on your way to living your best life. At True Life Wellness, our wellness program is comprehensive and individualized to meet your specific needs and wellness goals. We not only care for spinal health but also care for the whole person. We’ll teach you how to improve your posture, nutrition, and discuss the importance of why a body in motion stays in motion. In addition, we offer pediatric chiropractic care to be sure everyone in the family is healthy. Dr. Tyler Molstre and his team of wellness experts are passionate about your health. We want to help you achieve a more fulfilling life through the true principles of a wellness lifestyle. Dr. Tyler Molstre uses the least invasive, yet highly effective, modern chiropractic technology and techniques. Your low back pain, neck pain, headaches, ear infections and other life-limiting symptoms can be eliminated through chiropractic care and lifestyle changes. Why not give your body the gift of optimal wellness? Contact us today at (515) 225-2266 and find out how chiropractic can help your family live their best life. My energy has increased and I have less headaches. The pain is lessening and I can tell the functionality is coming back. Also, I’ve noticed that my digestive system seems to be improving as well. I am able to eat foods that I haven’t been able to eat in years without heartburn. I also feel so much better physically! My sore neck and shoulders have basically disappeared. I don’t have the constant tenseness that I used to. I don’t get headaches very often, and I rarely wake up with back pain. My neck is much better which has dramatically reduced my headaches. Also, my posture is much improved. I am more aware of eating well and taking care of myself. My knee and hip pain when walking is virtually gone. I can be on my feet for at least four hours. I’ve slept through the night more often. Dr. Molstre bolsters my spirit, and the whole staff is so caring that it gives me some faith in the human race. I had IBS for years. In the month and half that I’ve started care, my IBS has resolved. I feel like I have more energy and my dizzy symptoms have also cleared up. I feel like the health issues I have had for years (stomach issues, pain in back, neck, knees and hips) are finally being addressed. I didn’t expect chiropractic care to help with it all and it has. I’ve been under care for over two years now. I’ve noticed that when I do have an injury, my recovery time has only been a few days instead of a few months. Quality Care for Waukee, West Des Moines, Clive and Urbandale!